From time to time i find installations for report services failing. Besides checking all the regular stuff it might be possible that the report service got damaged while installing Operations Manager. 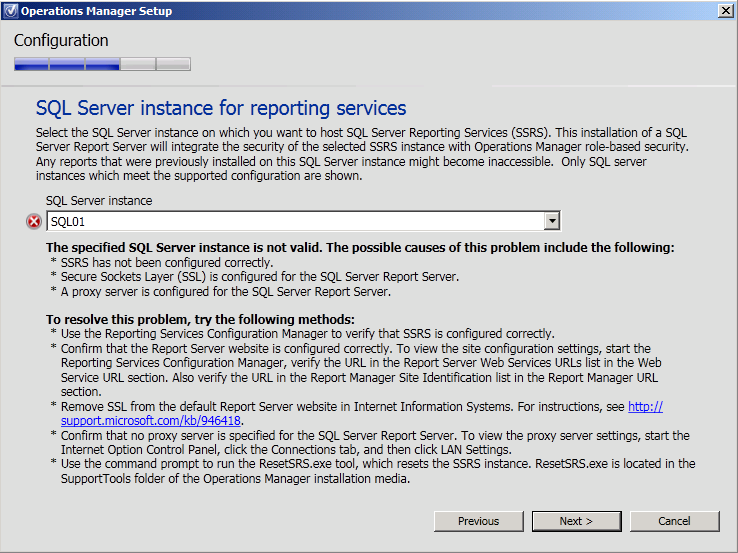 You should know that installing reporting needs to be done on a dedicated SQL server or instance. This is because Operations Manager will replace all security settings. A nice tool has been arround for a while and is to be found in the SupportTools on your source media is ResetSRS.exe. As the name says this tool is to be used for “resetting” the report services. For executing the tool copy it to the SQL server (choose an easy path like c:\). Now open an elevated command prompt. Go to the location where the tool is and use it in combination with the instance name or SQL server name. You will be prompted for credentials for an account that has enough permissions. The the tool will notify you when it succeeded. Now hopefully the installation succeeds!